When my first was little, I remember hearing that you were supposed to take baby to the dentist when they got their first tooth or when they reached one year old, whichever happened first. 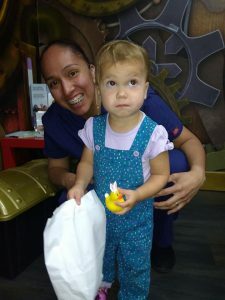 Being the dutiful first time Mom, I checked with our dentist to see if they had a pediatric dentist on staff and made that first dental appointment. On the big day, I brought my son in and then the disaster started. He wouldn’t open his mouth – at least without screaming – and when he finally did, they counted his teeth, reminded us to brush and sent him to get a toy. It was half an hour of thrashing, screaming and fighting for 3 minutes of “dentistry” that I could have done on my own at home. I was ready to swear off of the dentist until my kids were old enough to actually have something done. Or at least until I had a diaper bag full of toddler tips to surviving the dentist. Whichever came first. Well, I never got the tips, but my kids needed to finally go to the dentist. So now I’ve got three kids, and a bunch of dentist appointments under my belt – including appointments for my 18 month old! So I’m here to tell you that you can have a successful trip to the dentist with a toddler. You just need these tips. I admit that whenever I hear you’re supposed to take a one year old with two teeth to the dentist I roll my eyes. I mean, seriously. What could they possibly do at the dentist office for a baby? Turns out I was right. And wrong. On the one hand, is baby going to get a deep cleaning with all kinds of tools? No, probably not. Will they let your baby sit in the chair and lean back and brush her teeth for her? Probably. And will this positive experience lay the groundwork for future appointments where they’ll do more? ABSOLUTELY. So even if you roll your eyes, just do it. Someday you’ll be very happy that you did! If you’re feeling nervous about that first appointment and how your toddler will do, play dentist at home! Yes, it is well documented that I absolutely hate to play pretend, but at least this one will have a good payoff! You can call the dentist ahead of time to get a better understanding of what to expect from your first appointment. Then you can role play accordingly. 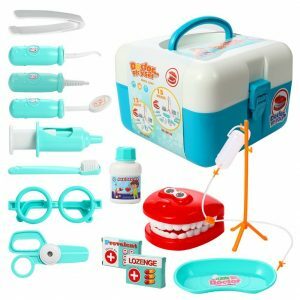 As an added bonus, grab your kids one of these role play dentist kits so that they can check out some of the items they might see at the dentist as well. 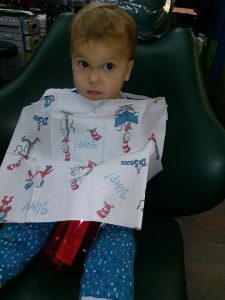 At our appointment, Izzie sat back in the dentists chair and had the hygenist brush her teeth. So get some practice with your child! Especially if you can try it in a similar environment, like laying back on the couch as opposed to standing n the bathroom. Work on making a game of your child opening their mouth and showing their teeth. The dentist will count your child’s teeth, so you can practice counting them along with your child. Not all pediatric dentist offices are made the same. The first office we tried was a traditional dentists office that happened to have a pediatric dentist. Sure, there were a few copies of Highlights magazine and a toy or two, but it didn’t exactly scream, “We love kids!” When we were ready to try again, we found the Disneyland of offices. It’s literally called “FUNtastic Dental” and the name does not lie. 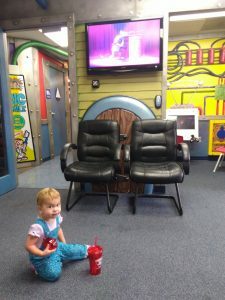 There are video games in the waiting area, tv screens everywhere showing your kids favorite movies, and of course the quintescential treasure box. If you are able, go take a tour of your kid’s dentist before they even have an appointment. Check out the vibe, the decor, and sure, even the treasure box. If it looks like your dentist office – it might not be the right fit. If it looks more like your living room with a dash of Disney? You’re onto something! “Kid-friendly” is cool, but even better is people that actually enjoy children and know how to interact with them. Our first dentist very kindly asked my kid to open his mouth to count his teeth. I’m sure it seemed very “kid-friendly,” but it wasn’t “kid-centered.” Because when my toddler didn’t immediatly comply, said dentist got a little more…..assertive? Aggressive? About getting my kid to participate. It was painful for me to watch, and it sure as hell wasn’t pleasant for my son. At our new dentist, the entire staff starts to woo your kid before you even see a dentists chair. The front desk staff happily greet the children and on your kids first visit someone comes out with a goodie bag of welcome gifts. Maybe this doesn’t work for all kids, but clearly my kids have been bribed once or twice in their life, because they all squealed with joy at the idea of getting presents in exchange for doing something new. 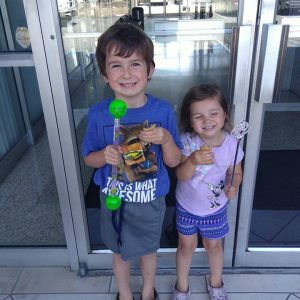 The hygenist and the dentist worked on forming a relationship with my kids before they tried to get inside their mouths. From showing them their tools, letting them hold the tools, playing peekabo behind their mask, and letting them touch their soft gloves, the staff can set the mood for a great experience. Unfortunately, you may not know until your kid is face to face with the staff. If you’re able to swing by to check out the site, ask to meet the dentist as well. Trust your Mama gut. We’re about keeping it real, and sometimes that means telling you these tips don’t always work. Because kids are kids, you can do everything right and still get a fussy kid. But that doesn’t mean you give up! 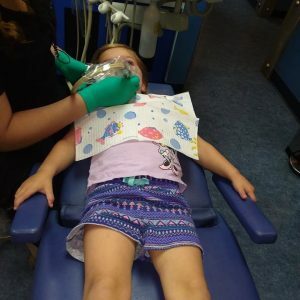 When my toddler HATED her first visit (yes, even with all the bells and whistles she was not a fan) we kept a smile on and made another appointment. While every fiber of my being wanted to head for the hills and never make her sit through that ever again, I knew that would get us absolutely nowhere. We came back two weeks later (yes, two weeks, because we couldn’t even get the cleaning done the first time) and she did SO. MUCH. BETTER. One good visit was amazing, but we wanted to make sure that every visit would go so smoothly. 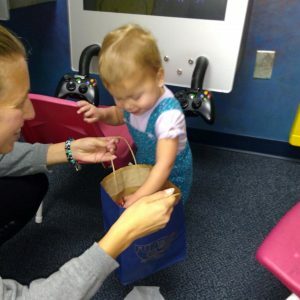 We kept up with the practicing at home, talking about the upcoming appointment, and had her older brother help reinforce that it would be a breeze – especially pointing out that she would get a toy at the end. Six months later, she was begging for her next appointment and was able to have X-rays done and sat through an entire cleaning without a single fuss. 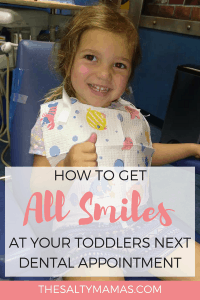 I never would have imagined that I’d say taking my 1, 3 and 4 year old to the dentist was a great day, but believe me, if my kids can do it, so can yours! It also helps letting them see you getting your teeth checked 🙂 We would take ours to the dentist when we had appointments and they loved watching and were always full of questions. When it came time for them to go for their appointments we had no trouble because they already saw it happen. Great tips! I definitely think finding the right environment is key to success. We found a great pediatric dentist in our area that seriously is THE BEST! We love him. My kids really enjoy getting to see him every 6 months.